Today I’m really happy to have Carmen Rivas on the show. And Carmen is actually a student in my Create A Profitable Online Store Course from Australia. She joined over a year ago and she’s been doing amazing with her business Vizcosa.com. Now I often get questions from listeners whether it’s possible to run a viable ecommerce business outside of the US and the answer is of course. Carmen sells kaftans and resort wear and what’s cool about her story is that she validated her niche using Facebook before investing a lot of money into her business. Today, she’s doing very well. She just had a baby and she’s able to run her business while taking care of her child! Enjoy the interview. Want To Learn How To Start A 6 Figure Ecommerce Store? Did you enjoy listening to Carmen’s story? If you would like to create your own profitable online store and join a community of like minded entrepreneurs, then sign up for my full blown course on how to create a profitable online store. How Carmen generated early sales for her online store. Steve: You are listening to the My Wife Quit her Job Podcast, the place where I bring on successful bootstrapped business owners and delve deeply into what strategies are working and what strategies are not with their businesses. I’m Steve Chou and today I’m thrilled to have another student in my Create a Profitable Online Store Course on the show. 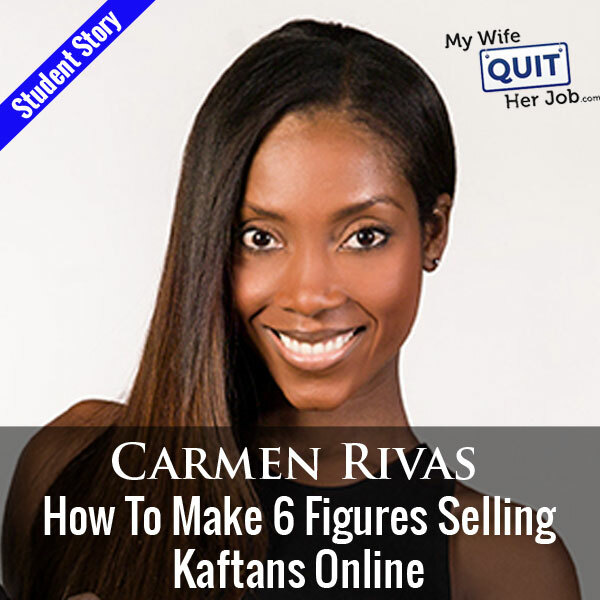 Carmen Rivas is a student from Australia who is now making a five figure monthly income selling kaftans on her own site, and in fact I don’t believe she has transitioned to Amazon yet, but she’s doing really well and you guys are going to really enjoy her story. But before we begin I want to give a shout out to Privy who is a sponsor of the show. Now, I’m super excited to talk about Privy, because I use and rely on Privy to build my email list for both my blog and my online store. Now what does Privy do? Privy is an email list growth platform, and they manage all of my email capture forms, and in fact I use Privy hand in hand with my email marketing provider. Now there are a bunch of companies out there that will manage your email capture forms, but I like Privy because they specialize in ecommerce. Privy is easily the most powerful platform that I’ve ever used, and you can trigger sign up forms based on any primer that you desire. So for example let’s say you offer free shipping for orders over 100 bucks, well you can have Privy flash a popup when the customer has $90 in their shopping cart to get them to buy one more item. Here’s another cool use case, if someone has item A in their shopping cart, I can easily tell Privy to display a unique and special coupon code for that item or to display a related item or offer. In terms of email capture, right now I’m showing a different email lead magnet depending on what product a customer is browsing in our shop. So bottom line Privy allows me to turn visitors into email subscribers, which I then feed to my email provider to close the sale. So head on over to Privy.com/steve that’s P-R-I-V-Y.com/steve and try it for free, and if you decide you need the more advanced features, use coupon code MWQHJ for 15% off. Once again that’s privy.com/steve. I also want to give a quick shout out to Klaviyo who is also a sponsor of the show. Now I’m really blessed to have Klaviyo as a sponsor because they are the email marketing platform that I personally use for my ecommerce store, and I actually depend on them for over 20% of my revenues. Now you’re probably wondering why Klaviyo and not another email provider. Well Klaviyo is the only email platform out there that is specifically built for ecommerce stores, and here is why it’s so powerful. Klaviyo can track every single customer who has shopped in your store and exactly what they purchased which makes it extremely powerful. So let’s say I want to send an email to everyone who purchased a red handkerchief in the last week, that is easy. Let’s say I want to set up a special autoresponder sequence to my customers depending on what they purchased, that’s a piece of cake, and there’s full revenue tracking on every single email sent. Klaviyo is the most powerful email platform that I’ve ever used and you can try them for free at mywifequitherjob.com/Klaviyo, and that’s spelled K-L-A-V-I-Y-O. Once again that’s mywifequitherjob.com/Klaviyo, now on to the show. Steve: Welcome to the My Wife Quit Her Job Podcast, today I’m really happy to have Carmen Rivas on the show. Carmen is actually a student in my Create a Profitable Online Store Course and she lives in Australia, she joined over a year ago and she’s been doing amazing with her business vizcosa.com. Now I often get questions from listeners whether it’s possible to run a viable ecommerce business outside of the US and the answer is of course. Carmen sells kaftans and resort wear, and what’s cool about her story is that she validated her niche using Facebook before investing a lot of money into her business. Today she’s doing very well, she just had a baby, and she is able to run her business while taking care of her child. And with that welcome to the show Carmen, how are you doing today? Carmen: I’m very good Steve, how are you, thank you so much for having me. Steve: I know, thanks for coming on, I just still continually find it amazing that I’m in the United States and you are in Australia and we are talking today. Carmen: I know, it was a bit hard to find the time but here we are. Steve: So Carmen how did you come up with a niche and the idea for selling kaftans online — first of all what is a kaftan? Carmen: A kaftan is a very glamorous gown; it’s pretty much a dress that women can wear in summer and you can wear it to a wedding, you can wear – especially something that you take to your holidays, but it’s just pretty much really glamorous, very elegant and it just comes from many years ago. Men used to wear kaftans and I think men still wear kaftans, but with the evolution of fashion now it’s a very fashionable gown that you just wear for an evening, for a cocktail, for a party and especially it’s really beautiful to wear at the beach during the holiday, because it’s very free flowing, very comfortable, mostly made of silk or luxurious fabrics and they are always decorated with stones, they are very colorful, so it’s something that will bring a very happy feeling when you wear. Steve: Okay and how did you come up with the idea of selling those? Carmen: I am a lover of summer and I really love fashion. I knew I wanted to start a business that was pretty much within the fashion industry, and if you see me during summer I will always be wearing a dress, long maxi dresses and anything that has to do with color and with free flowing fabric. So I really had this idea that I wanted something similar, and I actually had another business before, one of them was tape [ph] wear. It was something similar to spanks [ph] and that didn’t really go very well because it’s something that I love to wear, but I was trying to sell it without really finding what women really wanted. So when I decided that I was going to change my business within the fashion industry and go for something that was clothing, I started to ask around and ask before not necessarily something that I wanted to wear but what they want to wear, what they like, how they feel, what they wear it for. So I used two medias to validate that idea, one was Facebook and the other one was a survey that I did in Survey Monkey to my friends, and that’s how I came up with specifically kaftans. Steve: So real quick back in your other business when you were selling spanks like products, why didn’t those work out exactly? Carmen: I think it was I didn’t have the knowledge. I think if I start again now with that business it’s going to do well because it’s actually a really good product, but back then I didn’t have any mentoring, I didn’t know what I was doing, I was trying to sell wholesale, I was trying to sell online, but I was just trying to do Google AdWords and everything was all over the place. I wasn’t niching down the product, I wasn’t being specific, I was trying to be a little bit of everything, but I was doing nothing at the end because I wasn’t really targeting anyone in particular. Steve: Okay can we talk a little bit about the survey that you sent out; you mentioned that you were just trying to validate your niche, what were some of the questions on the survey? Carmen: It was pretty much, I really wanted to find out who these women were, so I started with age group, with occupation, income and also what they wear like what do you feel beautiful wearing, and also for different occasions because you might wear something to work and something different to a party, so I asked them everything, what do you wear to this and this and this different occasions. I gathered enough information to sort of – and I also knew that I wanted to go with summer wear and dresses, but I was very open to different opportunities. So at the end of that survey everything really pointed out to the kaftans. Steve: So who did you send the survey to? Carmen: I sent it to friends, pretty much to friends, I did it literary because in Survey Market you can actually buy an audience, so I did buy a little more audience but I also sent it to my friends. Steve: Okay and how many people actually responded to your survey just curious? Carmen: It was a while ago I don’t remember, I think it might have been no more than 20 people maybe; it wasn’t a lot of people actually. Steve: Okay and then when you were validating on Facebook, what was the process for that? Carmen: Okay so listening to – basically when I joined your course that’s when I started to have a lot of direction on what really I needed to do and the first thing was sort of knowing what people were looking for online. So I used a couple of different programs just to see what people were looking out for online, so it was with Google, Terapeak was one of them. So I decided – there was an interview that you have with Ryan Daniel Moran from Freedom Fast Lane. He was talking about how he started — it was I remember some business selling yoga mats, and that really gave me the idea to start a Facebook page just to start adding value having a little bit of information about clothing just to see what the response was going to be. That’s how I started the business, I didn’t even have the website yet, but I decided to really communicate with people through that. I started to really get a lot of information from them, what they wanted, what they wanted it for. I was very responsive if I got any questions and all of this was before even I have the website, and that really helped me to validate the idea. Steve: So you just created a Facebook page from scratch, how did you get early fans of your page? Carmen: It was with Facebook likes, so it was just the usual Facebook likes, I just would find dollars I remember at the beginning on to the page and people started to like it and every night I remember I will upload a couple of pictures and the pictures were just generic pictures that I took from Google. So everything was really generic, I was just trying to find out if people – what they like, where did they click like the most or if they put a comment, which pictures they were commenting on and things like that. That’s how I started; I just wanted to know where they were going pretty much. Steve: Interesting, so when you were posting these pictures, these were kaftan pictures that you just found on Google? Carmen: I did, some of them were kaftans, some of them were celebrity pictures wearing similar items. So I was posting everything that I wanted to sell, so similar items, they were not only kaftans but they were a little bit of different type of clothing just to still continue to understand what women wanted and what they really like, so pretty much. Steve: And just curious how big did you build up the space, like how many likes did the page end up having? Carmen: At the moment it has 10,000, a little bit almost 11,000. April we only had about 100 likes when I decided to start my online store. Carmen: It was very soon. Steve: And so you posted different pictures and then based on the level of engagement, that’s kind of how you chose which ones that you wanted to sell in your store? Carmen: Exactly because I noticed that it was a very good addition, so everything happened within probably a month. So probably by the time I have 500 likes I was very comfortable. I already felt, okay there is a – because I had a business before I knew that it wasn’t that easy to get even these 500 likes, and I knew with the business that I had before the engagement was really low. With this one even though it was only 500 people, they were very engaged. So I knew that this was enough for me to start. I made my first sale within that month because of the conversation I was having with customers and they were asking me for advice and I was giving them so much advice until this – I remember one of the women just I really I need this outfit for a wedding I think she was having, I don’t know what to wear and I started to sort of back and forth ask her what her style was, what time was the wedding, every question. She said, okay I really need that dress and I remember posting a picture of a garment that I thought was beautiful for the occasion and she said, oh I would really like to have that one. I said okay you can have it, and I went and I found it locally, I tried to find that garment everywhere I could and I found something very similar, and I created my website and I told her this is the link, you can buy it. Steve: Interesting, okay so you just bought it from a retail store and then sold it? Carmen: Correct yes, I was only at the stage of validating the idea and I saw, okay somebody wants to buy it, I don’t want to miss the opportunity. Steve: So on your Facebook page you were having conversations with people, did you ever try to pre-sell any of your products? Carmen: Not at that stage but very soon after but only within another week I started to source the product. I went to look for a supplier overseas and I got a few samples and everything was really quick, it’s really where I had samples on the website and I started to sell them. Steve: Okay and in terms of your suppliers how did you find them and where did you look? Carmen: I looked in AliExpress and I looked in Alibaba and I found a couple of suppliers there and there were various endless stages. I didn’t stay with so many of them, the suppliers that I have at the moment I actually asked them and I found them because I was trying to make my own designs, and I was trying to understand how you can make your own prints and how to print in silk and in fabric, and doing those searches I found actually my current supplier. I goggled him and I found him and I have a couple of suppliers now, but the biggest one was a little bit outside of Alibaba, but you can still find people there for sure. Steve: Okay but you started out selling other people’s designs first before? Carmen: Yes for only a couple of weeks, it was a very short time. When I understood that I was on to something, I really wanted to have my own business and I really wanted to have my own label and I wanted to be very original and doing my own things, I really rushed into finding my own brand really early on. Steve: Okay, I have a couple of questions just related to clothing like how do you decide how many of a certain size to buy and that sort of thing? Carmen: It was probably just 20 items, it was really small and they actually thankfully they have quite big minimums, but I managed to – on your course you mention all the time you can always sound like you are not exactly the final person they’re talking to, and so I started to sound like a bigger business and I said, look we really need samples to start with. So my first order was a sample order and that sample order sold really fast, and that’s how I started to build up on my bigger orders. Steve: So your first order was 20 you said, right? Steve: Was that different sizes or you did you just go with the common sizes? Carmen: It was different sizes yes. So obviously I kind of run out of one size and then run out of the other. It was a struggle at the beginning just to get it right when it came to sizes. Steve: Okay and then after that your orders – what were some of the minimums that you were encountering? Carmen: I started to order 15 minimum and then they started to have minimums when it came to a particular print, and obviously when you start making your own print, then the minimums are bigger because they need to do a production run for something that they didn’t have, and it’s something that is exclusive to you. So the minimums started to build up a little bit, so at the moment – I mean it was very slow and they were quite flexible at the beginning, so I would order 15 here, 20 there until I stated to build it up on my own prints. Steve: Okay, I’m just curious did you look locally at all for sourcing or did you go straight overseas? Carmen: I went straight overseas, however yes at the beginning it was a local supplier the very first ones. Yeah I definitely went overseas and actually I had looked in America back in the day when I first I had this idea, because originally I’m from Colombia so in my way there I actually looked in America for suppliers and there is actually good ones there, but at the moment I’m not working with any American suppliers. Steve: Okay and I’m just curious what is the price differential from going to China versus like the US or Australia for example? Carmen: At the moment I’m working with India and I think the prices might be quite similar. Carmen: Yes, it probably might be a little bit more expensive than to go to America and a little bit cheaper to go to China I will say, but the prices are not – it’s just not that massive. I think when it comes to silk; silk is not cheap anywhere so I think is very similar regardless, yes. Steve: Okay, so if that’s the case why are you still going overseas as opposed to going locally? Carmen: Nothing local, at the moment I don’t have anything local, I think the quality one — I haven’t really explored someone that can actually make my own garments locally. You can find local people but obviously they are sourcing it from overseas. Steve: Okay and when you first got started how many designs – like there is this misconception that you have to have like a huge variety when you launch. I’m just curious how many styles you had when you first launched your store? Carmen: Yes definitely it doesn’t have to be a lot of styles and like myself and I used to have that belief as well, I have to have a massive store for people to come and buy and they need to have all these options. But no, at the beginning as I said the first time was one dress that one particular lady wanted to purchase, so I had that one on the website, and then I started to upload a couple, so probably when I first launched the website I have five designs and I started to build it from there. I didn’t have a lot of designs and I don’t think when it comes to someone wanting to buy your product, I don’t think they are very worried about you having a massive amount of choices. I think it is all about offering quality, being trustworthy and offering something that they really want and need and being there for your customer and building that relationship. They don’t really care that you have a lot. At the moment I have somehow many more designs but I didn’t start with that many. Steve: Okay and then what platform did you ultimately choose to run your store on? Carmen: At the moment we are on Shopify and I do have experience with having open cart when I had the underwear business and that was very difficult. So I recommend to everyone just go to Shopify, it’s much faster. Steve: Did you do your own website design on Shopify? Steve: Okay and just curious how long did it take you to get your store up and running assuming you had all the photos and everything ready to go? Carmen: It was really quick, I did it probably in a weekend, but I’m not saying that it’s something that is that easy to do. I did it that fast because I spent years before with my other business. So I already made all these mistakes, I already had a little bit of experience with Photoshop, I knew how to sort of the photography, I really knew photography well, I already knew more, I really knew how to organize a photo shoot. I really understood the whole process; I understood a little bit of design because I learnt all of that from my previous business. So it was very fast when I started this part of the business, just setting up the shop because I had the experience and I also had an open cart website before, so I was involved with a little bit of coding and a little bit of everything. I understood a little bit. Not very technical but I understood. Steve: Okay and just curious like you mentioned are you designing your own patterns for your kaftans or just the prints? Carmen: Everything at the moment. Steve: Okay, does that mean that you know how to design clothing? Carmen: Well I will say maybe yes. Steve: Or did you hire someone to design it for you? Carmen: No at the moment I do the whole design, the whole process. Carmen: Yeah at the moment I do everything, obviously I’m not a graphic designer, so I do work with graphic designers to help me put it all together, but I do solve everything, the inspiration, how I want it to look, how the sleeves look, how long is it going to be, how wide, all the measurements, all the patterns, everything. I am, different samples everything together and give them the instructions to get it all done. Steve: I just want to take a moment to thank ReferralCandy for being a sponsor of the show. Now for any ecommerce store word of mouth is huge, and when a customer is super happy with their purchase they will tell all of their friends. Now what if there was a way to amplify word of mouth about your company, what if there was a way to reward referrals for your business? This is where ReferralCandy shines, with just a couple of clicks of the mouse you can add a referral program to your ecommerce store and reward your customers for telling their friends about your shop. And this tactic works wonders; in fact it’s not uncommon to get a ridiculous return on your investment. So for example Greats Footwear, who is a ReferralCandy customer, is seeing a 20X ROI. Referral word of mouth marketing is also useful for building up your social media presence as well, because referrals share with their friends on Facebook and Twitter. And the best part is that ReferralCandy is a set it and forget it service, requires no technical setup and they are giving My Wife Quit Her Job listeners 50 bucks to try them out if you go to promo.referralcandy.com/steve. Once again that’s promo.referralcandy.com/steve to get a $50 credit to try the service. Now back to the show. So what software do you use to do that, I’m just curious? Steve: Oh Photoshop okay, so you just lay out the measurements in Photoshop? Steve: Okay so there is nothing special in terms of software or graphic design? Carmen: There is a bit at the end, when they are going to print it they have other softwares that they need to put it all in to their softwares and then they need to print on to the fabric. So I don’t do the printing because that all is done overseas, but I put together the design and how everything is going to look and what the measurements are and I send it to them, then they need to put it on their own systems just to get it finalized pretty much. Steve: Okay and in terms of what you’re sending them, is it just like each individual piece of fabric cut out? Steve: Oh no that’s not what I meant, I meant like when you’re laying it out in Photoshop, is it on a per piece basis like a kaftan might have different pieces of fabric sown together. When you’re sending them in the Photoshop, are you sending them a design of each individual piece of fabric and then they put it together? Carmen: Yes correct, so it’s a lot of specifications and a lot of measurements, and I actually do everything at home and I start to try them at home and I try it on. I also have my sewing machine here if I need to put something together. So I try to do as much as I can until I am comfortable with it and then I can tell them, because a lot of things can get lost in translation as well. So I make sure that I understand and they understand what the final is going to look like, and then we just do one sample and they send me the sample, and then it’s a little back and forth until I am happy. Steve: Okay that’s amazing, so you’re like a one stop shop yourself, like you understand how to design the clothing and you even put together a sample yourself like a prototype? Carmen: Yes, yes I also I always have loved clothing and that type of clothing, so I had an idea and my family has always been involved in fashion and my mum is very good at sewing and making clothes. So I kind of have a lot of that idea of what is involved making clothing so yeah. Steve: Okay, all right well let’s shift gears and talk about sales, so you got your first sale off of your Facebook page, how are you making consistent sales today? Carmen: It’s actually the same, so it has continued to be Facebook but over the times, it’s been about a year that we have been within on the business and it has started to grow a little bit outside the Facebook but it is still a community that we have there. Now that I started to gain regular customers, so I have continued other relationship with them through email as well, and that’s pretty much how we have continued either a little bit of influencer marketing, some couple of bloggers that have been working with us to build the brand, but it’s pretty much still Facebook page. Steve: Okay can we talk about your Facebook page then, how do you maintain it like how often do you post, what do you post? Carmen: I post at least three, well sometimes nothing but ideally it is at least three times per day just to continue with the consistency, and I found that my customers really love it. I just make sure that everything is about engaging with them and everything is about having that conversation and everything is about them, and every time somebody comments being there for them straight away. Even if they say well I love this and this is beautiful always reply thank you so much, thank you for the love, we can’t wait to show you what’s coming. It’s all about staying in touch with the customers. Steve: How do you decide what to post, are you just posting pictures of products or are you posting content? Carmen: At the moment well it was pretty much through that but right now we’re posting little bit of content, so slowly started to do a couple of blog posts but even each picture on its own has a little bit of content on it. So it’s not only the photo, but the photo might have a little bit of [inaudible 00:28:08], it might say this particular color will look beautiful with this particular type of shoes or this particular location. So even that picture has a little bit of information and a little bit of advice and I think that’s what our customers love because it’s not about only telling them buy this, it’s all about what do you need, I’m here to help you and I’m here to give you advice. Are you going to a cruise ship, this is what will be beautiful to wear for thin air, that’s what – this is beautiful for the pool side, so they really respond to that. Steve: So are you posting these questions on the group as well? Carmen: Yes, it’s only a Facebook page, we don’t have a group. Steve: Facebook page, okay so you’re like doing customer service on your Facebook page essentially? Steve: Okay and are you still buying likes at all anymore? Steve: Do you remember how much you paid for those 3,000 likes early on? Carmen: I remember back on the day I was probably investing $5 or $10 a day and getting maybe 20 likes. Steve: About 25 cents a like? Carmen: Yes something like that, but very early on I stopped yes. Steve: Okay and I’m just curious when you’re running a Facebook page now like when you post something the reach is very low, so are you boosting your posts, are you paying for ads? Carmen: Ads, so at the moment it’s all ads based and that’s how we reach and continue to reach customers, so it’s pretty much ads every day and there’s a combination of ads and a little bit of email marketing, yeah that’s pretty much. Steve: Okay do you feel comfortable talking about your ads a little bit? Carmen: Yes let’s talk a little bit. Steve: Okay all right so what does the ad copy look like and who are you targeting? Carmen: The target is – do you want to be too specific about the particular target? Carmen: But I mean a little bit in general, I do different ads for different targets, and then I see which one is going to take off, so it’s a constant trial and error all the time. Steve: Are you pointing your ads directly to your kaftans or do you point them to like a content page? Carmen: No it’s actually to the product. Steve: To the product okay. Carmen: Yes to the products. I remember you mentioning a lot what you do pointing it to content, no but I do directly to the product. There is something I might explore a little bit of going to the content but people really actually like to see the products really like. Steve: Okay and then so you’re making more money than you’re spending on these ads obviously? Carmen: Oh yes they are really profitable yes. Steve: Okay and are you selling only on your site right now, are you selling on Amazon or anywhere else? Carmen: No I sell on eBay actually. Carmen: Yes but not a lot, just a little bit because of the price point. We have an early rush, our cheapest price is $120 so probably eBay, there’s not a lot of people on eBay that will see – they will go and spend that kind of money probably, but I have an eBay page and I have people coming through it and making purchases as well and they are really happy as well, I get beautiful feedback from the people there, yes. Steve: So I’m just curious why eBay and not Amazon? Carmen: It’s just been a lack of time probably, Amazon is definitely something that I will be exploring soon, but Amazon is just being probably lack of time, my being just busy with the website and to be honest my original idea was to go on Amazon. That was my objective and I never even wanted to start my website that soon within a week. What I was going to do is the Facebook page, use it to start my Amazon business, but because I saw that the business has started to not only be an online store but it started to become a little bit of a brand, I decided, okay I might just stay within my website, it’s something that I probably will have more control of. Amazon is a little bit more difficult being in Australia, so it is just at the end even though that was the idea, I think it turned out a little bit better for us to stay within our own website and build our own label in our own realistic rather than being in Amazon. Steve: I’m just curious, so that means you’re carrying your own inventory, is that correct? Steve: So where are you storing everything? Carmen: Everything is at home. Carmen: There is a lot of stock. Steve: So does that mean that you do your own shipping and fulfillment as well? Carmen: Yes I do everything, not for long, I think is we’re getting to the point where it’s just not going to happen for everything to stay here for me to do everything, so yes, so very soon it’s going to change, and we got nothing with fulfillment. Steve: So I’m just curious how do – I mean you have a new born, so how does your day look? Carmen: Well I’m very busy; it’s not a lot of sleep. For new mums out there they understand what it is like but I also will say to any new mum in business that it is definitely possible and it is actually a good idea to start before hand before you have the baby, but it doesn’t matter what stage you are at. So it’s pretty much when the bay sleeps I work, that’s how my day is like, and I have a good baby in terms of he’s easy going when he goes to go out. If I need to go and run errands for the business he’s let me and he’s very good, but pretty much I wake up in the morning, I feed the baby, I get ready to start my day, I put the baby to sleep and I do some work and then it’s all about going back to feed, going back to play for the baby, I’m going back to work for me. So that’s a very busy day. Steve: Do you get a lot of phone calls? Carmen: I do but I don’t offer – so pretty much there is no numbers on my website. Carmen: No it’s only when someone contacts us by email and they say they want to talk to someone I will definitely give them the number. I do have a number for the business, so I do give them the number and they’re happy to call where I said to them I’m happy to give you a call back with this number to those and that’s how we do it. Steve: Okay so here’s a couple of rapid fire questions that I’m just curious about, so how much money did you invest to start this business? Carmen: It was only pretty much just the cost of the website and the cost of the first garments and it took off from there, so it was probably around $500. Carmen: Yes I will say it’s not a massive investment, and obviously the investment on the course, because I think everything really took off when I started the course with you. So I think that has been my best investment today for sure. Steve: And how long did it take you to put up your site? Carmen: Just to get it up and running? Steve: Like you had experience with it. know if you heard of it. Carmen: It took me six months to have the website and even after those six months I was literary crying, I had all these developments and people though – please help me because I couldn’t even get it to work. So I learned so much by having that website that now having a Shopify website everything is so much faster and so much easier, and I had the experience just to get it all working. Steve: Okay and if you had to pick one thing, what would you say your main struggle was in starting out? Carmen: It was definitely finding the niche, it was finding the niche and obviously connecting to people, and once that happened everything became not on a smooth sail but everything started to make sense. Another struggle is definitely sourcing the product, finding people that you can trust, because you need to understand what quantities you need and you need to take so much risk especially for me because I’m carrying all my inventory and everyday I’m making this business but also everyday I’m buying more and more and more inventory. You need to really find people that you trust that they want to send you the quality that you really want. Steve: Can we talk about your vendors a little bit, so are you going with your original vendors, or have you switched a bunch? Carmen: I do have new ones but I had these ones for months and months at the moment. Steve: Okay and how did you get them to ship you such small quantities because it sounded like you started out with very low quantities? Carmen: Yeah I was just lucky I think. When I first contacted them they are very good vendors and the quality is amazing, so they can just be very difficult and say no we only do these minimums, but I was just lucky and I said, look this is a business that is going to be amazing and I said to them, it’s already a big brand but I need to know your products first, and I need to know if your product is the quality that we’re looking for and I really need samples. So at the beginning that’s how we did it, so they sent me samples and they saw that I was serious because mine is all necessary to be bigger as I promised, and I said mine is all necessary going to be bigger and bigger and that’s what has been happening month after month and I think they trust me and now we have a good relationship. Steve: Let me ask you this, are the same vendors that you started with early on, are those the same ones that are manufacturing your own designs now? Carmen: Yes correct. I changed a little bit so I now have a vendor that I stumbled across just trying to find something else and that one is my main vendor at the moment, so that was a bit hard, that was like a lucky strike to find, but I will say Alibaba, AliExpress is still good places to find people. Steve: Okay and then this other one you just said you found through search or? Carmen: Yes through search as well yes, so I just been lucky with those ones. Steve: And when you are approaching someone randomly like on search, how do you vet them, is it the same process you ask for samples and then you just go back and forth? Carmen: Yes and I really like the fact that there were not very sellsy either, I think they were very private, they are very hard to find and very hard to get in contact with. So to me that sounded like a good thing, and at the same time they were also a little bit skeptical who are you anything, and I think it was a little bit of back and forth to get to know each other and that’s how we got there. It was a trusting relationship and they started to send me samples and it was all about doing everything. I tried to be very professional, I sent them a questionnaire before anything with every question I can possibly have, and I said to them once you answer these questions to me these are our terms. So please make sure that everything you answer that’s how you – everything about minimums, everything about privacy, everything, so make sure that you’re happy with that, everything about shipping. So they will reply and I will reply back and I said I didn’t like this condition what this means, so it like a real contract in between so I did everything — from the beginning everything was so professional, involves but it really works out. Steve: And in terms of quality control, I mean we do handkerchiefs which is much simpler than kaftans I’m sure and we run into quality problems and I’m just curious if you have run into any quality problems and how you address them. Carmen: There have been minor quality problems, probably I had one or two products that I had problems with and when that happens I will just say to them, look this happened, please make sure it doesn’t happen again because it’s just not a massive amount, I haven’t had any massive issues. Steve: Okay does that mean you have inspectors over there or? Carmen: No, no not at this stage. I definitely want to start working with inspectors just to make sure that as we get bigger everything is going to be okay, but no I’ve been lucky I’ve to say I’ve been quite lucky. Carmen: Yeah because I always get a sample before anything especially when I’m going to launch a new product. I get the sample, I try it on, I make sure, so obviously the sample is going to be fine. So it’s about trusting that the production run is going to be the same as the sample. Steve: So Carmen there is a lot of people listening and they are kind of on the sidelines right now, and a lot of them want to know really how hard it was for you to get started, and what sort of advice would you give to people who are kind of waiting on the sidelines today? Carmen: It is definitely not easy and I understand how everyone out there is feeling. I really want to have my business, I really want to start but I have no idea where. My recommendation is continue to learn and continue to invest on your education, find a mentor. I did your course and that gave me so much direction and also I did benefit so much from your podcast, and that’s why I’m so excited to be here because if in a small way I can tell my story and help other people, I hope that will help them just to push through. So it’s not easy, it’s not easy to find your niche and it’s not easy to find your product, but it’s also not impossible and it’s also about trial and error. As I said before this business I started another one and that one was not only online, it was a wholesale business and I made so many mistakes but it was all about trying because every mistake that I made really taught me something new. So don’t be afraid of making the mistakes, just make sure that the risks are calculated, that you are not investing huge amounts of money, that you make a small investments here and there with a little bit of the stock, get a few samples until you find something that will stick pretty much. It does happen and it does happen when you continue to educate yourself for sure. Steve: One thing I liked about your story Carmen was that in the beginning you didn’t invest any money at all really, like when someone made an order you actually went out and just paid retail prices and shipped it. Steve: And you did a lot of research before investing a large sum. Carmen: Yes because I already made the mistake before, I already had another business and I had a business for a while and I had so much stock that I purchased without knowing exactly which ones were the correct ones, so I bought all this stock and it’s just I think that was the problem just going thinking this is going to be amazing, I’m going to go and buy all this stock. So you need to find out first if it’s going to be amazing and then do very slowly, and once you’re confident then yes go for it and take a massive risk because you already known this is going to sell eventually at least. But I already made a mistake and I know many people have done it in the past, but yeah you don’t have to buy so much stock at the beginning. Steve: Okay, hey Carmen I really appreciate you coming on. If anyone is interested in what you have to sell, where can they find you? Carmen: They can find me on my website which is vizcosa.com, so it’s V-I-Z-C-O-S-A.com, that’s where they can find me, and if they have any questions for me I actually didn’t tell you I have a little of a side project going on which is mentoring for anybody because I get so many people asking me how did you start your business. So if anybody has any questions, they can actually get in touch with me in vizcosa.com/page/mentoring, so they can get to me and stuff. Steve: Okay and you ship outside of Australia at the present time or just in Australia? Carmen: Yes I get customers from – I even got a customer from Germany. Steve: Well that’s good to know, so if anyone needs a kaftan, check out vizcosa.com. Carmen: Yes I can give you a code for your audience if they want to get a kaftan. Steve: Well you’re going to be part of my holiday gift card again this year, right? Steve: Okay wonderful. Well so you guys can look forward to a blog post where I outline a bunch of stores that some of my students have put out and obviously Carmen is going to be there. Carmen: Of course, my pleasure, I will be more than excited to. Steve: Okay well thanks a lot for coming on the show Carmen, I really appreciate it. Carmen: Thank you so much for having me Steve, it’s been a pleasure. Steve: Hope you enjoyed that episode. Now I often get questions from readers whether I have any international students who have been successful online, and not only is Carmen doing great but she’s making the majority of her sales on her own website as well. For more information about this episode, go to mywifequitherjob.com/episode156. Once again I want to thank klaviyo.com for sponsoring this episode. Klaviyo is my email marketing platform of choice for ecommerce merchants, and you can easily put together automated flows like an abandoned cart sequence, a post purchase flow, a win back campaign, basically all of these sequences that will make you money on auto pilot. So head on over to mywifequitherjob.com/Klaviyo, once again that’s mywifequitherjob.com/Klaviyo. I also want to thank privy.com for sponsoring this episode. Privy is the email capture provider that I personally use to turn visitors into email subscribers, therefore email capture, exit intent, and site targeting tools to make it supper simple as well. I like Privy because it is so powerful and you can basically trigger custom pop ups for any primer that is closely tied to your ecommerce store. If you want to give it a try it is free, so head on over to privy.com/steve, that’s privy.com/steve. I talk about how I use all these tools on my blog, so if you’re interested in starting your own ecommerce store, head on over to mywifequitherjob.com and sign up for my free six day mini course. Just type in your email and I’ll send you the course right away via email, thanks for listening. Steve, I have been following you for a while now. Thank you for this podcast, I am so grateful I took time to listen to it. What an awesome interview. I really need to do your course!!! Do you vet who you interview? I looked up this lady’s website stats via SEMRUSH and their is barely any traffic. She says her Facebook page has 10K likes…I only see 1K? Vizcosa is her brand page but not the page she uses to drive traffic. Here is her I Love Kaftans Facebook page. Is this six figures revenue or six figures profit? There’s a big difference. I see a lot of people talking six figure venue but making very small profits.